I was born and raised in Detroit. A graduate of Brother Rice High School with college studies at Aquinas College in Grand Rapids, Michigan. I took broadcast, voice and acting courses at OCC Farmington Hills, Michigan. I have spent the last forty-four years as a radio broadcaster and freelance voice-over announcer. I’ve also worked for Sony Music Corporation (Columbia Records) as both a local and regional promotion & marketing manager specializing in artist development, marketing, and retail. I currently enjoy doing a podcast and telling kids to get off my lawn! I was the public address announcer for the two-time World Champion Detroit Pistons for 16 years, retiring after the 2001 season. 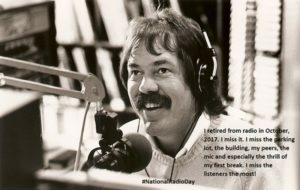 Grew up listening to Ken “The casual One” Calvert as he made is way across the FM dial. Great guy, Great Voice !